I’m an early adopter of Twitter and I really liked it when I started. Then I sort of just forgot about it for a couple years. I can’t really explain my neglect. I think I just got distracted by exploring all the other tools that developed, including, the Facebook monster. Recently I have gone back to Twitter, started to get involved again, and am remembering why I was originally drawn to this particular social media platform. From the beginning, Twitter’s structure has made it challenging to understand for the casual user. The open API adds another level of complexity with lots of third party apps building on top of Twitter adding functionality. Th ability to direct Tweets at other users by including their handles, the hashtag (#) system allowing for Tweets to be discovered by others and categorizing content creates the possibility for a great amount of interaction between people of all types, not just your “friends” on Facebook. The same features that can make Twitter feel like a worldwide open discussion also allow for trolls a bots to shadow that world. These things can make Twitter seem like a mean and frightening place. Many well-intentioned people have been driven off Twitter by its dark side. So, if you decide to play in that schoolyard you may need to arm your heart agains the bullies. The complexity, the seeming chaos, the potiential threats, virtual and real life that can emerge, are all reasons that are probably why Twitter’s user numbers continue to struggle compared the anodyne but seemingly magnetic Facebook. But if you can wrap your arms and mind around all that, it can be a fascinating, exciting and fun place. This time around, I can’t seem to stay away for long. A day off Twitter and I fall victim to FOMO (Fear of Missing Out). My fingers begin to twitch. Still, I think of myself as a novice. Features have been added since I first started years ago. The third-party tools have changed. New strategies and techniques that I had never heard of have evolved. I barely have enough time to stumble around in the platform, let alone make a concerted effort to study the techniques for effect particiapation. One of my stumbles forward was when I made the following post after listening to a podcast about free speech. Shortly after finishing the episode I saw a related news story and tweeted the participants in the podcast about that story. This post caught the eye of many people. It was retweeted many times, “liked” (thes heart icon) by hundreds and a conversation with many, many people (the cartoon talk bubble icon) involved for about two weeks. Given the average life span on a Twitter news feed is about 20 minutes, this was astounding, at least for me. It’s difficult to say what triggered this reaction. 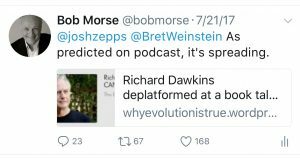 Probably, it was a perfect combination of the topic (free speech is a hot topic on Twitter), including the two Twitter handles of the people involved in the podcast and the news item about Richard Dawkins having his talk at U.C. Berkeley cancelled. I’ve yet to recreate the success of this Tweet. I don’t consciously set out to do so. But it is in the back of my mind as I fumble my way. Since I do use the platform to also talk about my business, perhaps it’s time to learn, to make an effort to be more systematic, strategic and effective. If you’re on Twitter (and I encourage you to be), please follow me and see how I do. I will follow you back. Promise!